Solid neutral zone player and large presence in front of the crease allowing him quality scoring chances. Eric needs to leave the crease and use his slap shot more and develop his defensive zone skills to create more scoring opportunities. There was a lot of talk around the acquisition of the 6’4” 221 pounder coming to the organization to flank Crosby or Malkin. 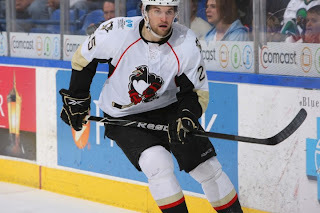 He played well for Wilkes-Barre this year with 65 games under his belt. During the season he tallied 17 goals, 22 assists for a total of 39 points and 31 penalty minutes. Eric was called up for one game in Pittsburgh where he had more than 14.5 minutes of ice time and 3 shots on goal. Eric will continue to develop his stills at the AHL level becoming a team leader. Unfortunately for us WBS fans, as his play continues to improve we can expect to see more call ups and eventually a permanent spot in Pittsburgh. In his media appearance the other day, Ray Shero mentioned Eric's name first in the line of "prospects" who will be fighting for a roster spot in the bigs. While we all know Ray would like to give Eric one more full season in WBS, if "Tank" can prove his worth, he would be a perfect financial alternative to the veteran winger Shero seeks to fill the gap currently. Yes, for both his play on the ice and "Tangradi Trivia". Coach Bylsma gave him 14+ minutes of ice time and FSN Pittsburgh even gave him his own highlight reel at the end of his first game with Pittsburgh. Enough said. Yes. Signed through the 2010-11 season. Look for extension talks mid-season.